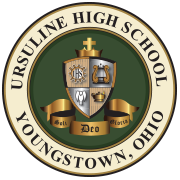 Each September Ursuline students participate in a retreat program. The senior and junior retreats are held at the Villa Maria Educational Center and the sophomore and freshman retreats are held at Kilcawley Center at Youngstown State University. Each retreat is designed to foster class unity, enhance prayer life, and deepen relationships with God. The high school experience is a journey and each retreat reflects on the unique part of the journey that students are on at the current time. The retreat program is funded through generous parent donations. Thank you to those who contribute to this worthwhile endeavor. Please see our Photo Gallery for photos of each retreat.